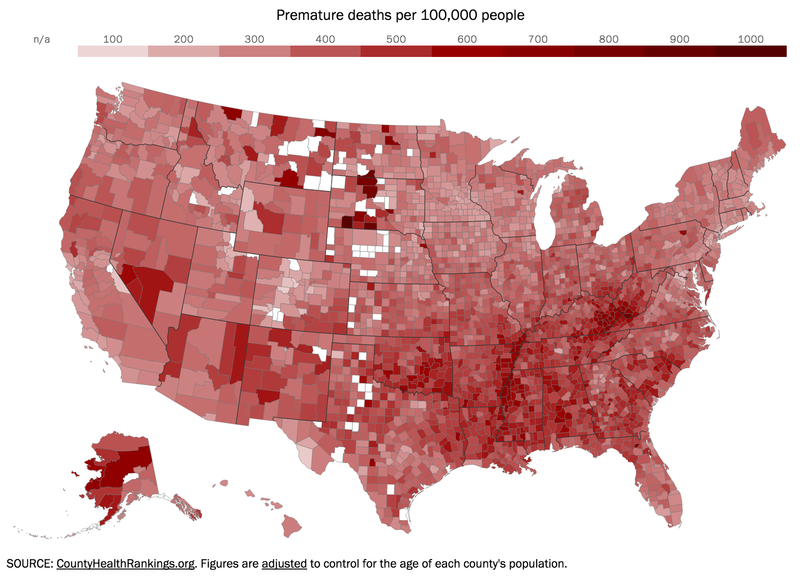 This Map Shows the Deadliest Counties in the U.S.
Oglala Lakota County, South Dakota, is the deadliest county in America, at least by one measure: it is the place where residents are most likely to die before the age of 75, which health experts consider premature death. The new edition of County Health Rankings from the University of Wisconsin Population Health Institute, places the county — which until very recently was called Shannon County — at the bottom of the class in the number of people who died before age 75, a common measure of public health. Oglala Lakota County sits inside the Pine Ridge Indian Reservation, whose residents suffer from a number of well-documented health problems. While South Dakota has a number of counties with high rates of premature deaths, the unhealthiest region in the U.S. is arguably the heart of Appalachia, from eastern Kentucky into southwest Virginia and southern West Virginia. Many of the counties have rates of smoking and obesity north of 30% of the population. The annual health rankings use a measure called “premature age-adjusted mortality” from the Centers for Disease Control and Prevention as one of their main indicators of overall health. This factor uses statistical methods to adjust for the overall distribution of ages in a county, so that one can compare mortality in any two counties independent of whether one has an overall younger population than the other. Across the country, the median value for this figure is 376 people per 100,000, meaning 0.38% of population will die before age 75 in a given year. (That’s all people, not just those who pass away.) The value for Oglala Lakota County is 983.4, while the lowest in the nation, in Pitkin, Colo., is 118.5. A sufficient sample size was not available for 69 counties, colored white in this map. The 25 counties with the lowest mortality rates and the 25 counties with the highest rates are listed below.